SYNOPSIS: When August learns that his best friend, Jack, shows signs of degenerative hallucinatory disorder, he is determined to help Jack cope. 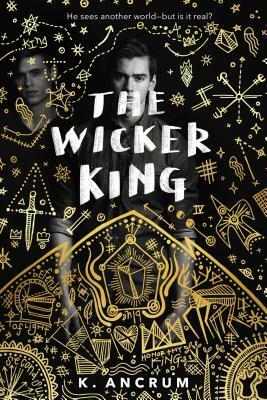 Jack’s vivid and long-term visions take the form of an elaborate fantasy world layered over our own—a world ruled by the Wicker King. As Jack leads them on a quest to fulfill a dark prophecy in this alternate world, even August begins to question what is real or not. Thank you so, so much to the author of this beautiful little book, and everyone I’ve spoken to about it, for convincing me to give it another try. I will carry it with me in my heart, and I know this is a story I will revisit time and time again. I absolutely cannot wait to see what K. Ancrum creates for us next. T10T: Characters Who Improved Their Books – Big Time! I’m glad you liked this so much more! I have an ARC of the book, but I havent wanted to read it because I’d seen some less that awesome things about it. I guess I need to get my hands on a finished copy. Yesss, I would STRONGLY recommend getting the finished copy instead of reading the ARC. Hopefully you enjoy it! Ugh they are SOOOO precious! Yesss, the singing. ♥ I also loved their interactions inside the hospital/ward/thing – so sad and angsty.